COINTEST: Win one of Yáahl's Feathers! 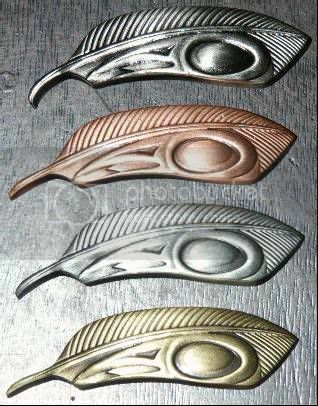 Ok, I have been threatening..... errr ummm, promising to have a cointest for my Yáahl's Feather geocoins so here we go! In the mid 1800's Henry Ward Beecher is quotes as saying, "If men had wings and bore black feathers, few of them would be clever enough to be crows". This begs the question: Are YOU clever enough? Please read all rules and instructions carefully! I make all rules and decisions. No whining or complaining allowed. Appeals are acceptable. This cointest is open to all registered Forum users with at least 20 posts. Anyone with fewer than 20 posts may also play if they have two Forum users who have 20 or more posts vouch for them. There is a limit of one Feather per qualified Forum user, whether as a prize or gift. If I send a Feather to you without your winning one of the puzzles or questions you still may not win a second one thru this cointest. All answers must come from you. In other words, you may not send an answer for your two-year old who would never be able to understand and answer a question or solve a puzzle for themselves. There will be age specific puzzles or questions if there are enough children who are registered Forum users or vouched for who are interested in playing. All answers to all puzzles and questions must be e-mailed to yaahl.raven@gmail.com . Any answers posted in this thread will be ignored. Any answers e-mailed to me thru my profile will be ignored. Any answers sent to me via P.M. will be ignored. As only one Feather may be won (or gifted) per qualified Forum user, all answers sent by previous winners (and receivers) will, of course, be ignored. To help me keep track of which question is being answered or puzzle solved I will be numbering and naming each puzzle or question. Please have the puzzle/question number and puzzle/question name in the subject name of you e-mails (Eg: Yáahl's Feather Cointest, Puzzle #1, "Who's on First?"). Also include your first name and caching name after your answer in all e-mails. The first correct answer – determined by the time stamp on you e-mails – will be the winner. I will contact the winner for their mailing address and their caching name will be posted in this thread. Each winner will be asked to choose a number between 001 and 130 and to choose one of the four available finishes. If you'd prefer the number to the finish or vice versa, please let me know. Your chosen number may not be available in the finish you'd prefer so I'll need to know which is more important. Also, remember that another winner may have chosen your number. If this is the case I will default to the finish choice. I will do my best to post at least three questions or puzzles per day but please remember I work eight-hour shifts on the days I work and will not be able to announce winners or post new puzzles/questions until I get home and unwind a bit. Also, because of my work schedule, I can usually only get to the Post Office during their business hours on Wednesdays so prizes will only get mailed out once a week. This is necessary for non-domestic mail. Those who win on Wednesday evenings will have to wait the longest unfortunately. And finally a request: Please do not post "E-mail sent" in this thread, as it will unnecessarily lengthen it. Questions, comments and congratulations are, of course, welcome. And so, without further ado, let the games begin!!! First question will be in my next post. The first person who sends me the title of the song, name of the album and the name of the band will win one of Yáahl's Feathers. Extra credit (but not an extra feather) if you name the lead vocalist. Remember to send all answers to yaahl.raven @gmail.com. Do not post your answers here. Whoo hoo! That did not take long! We have our first winner! Congrats! I had found the answer two minutes after the post but forgot to include my name in the email. Are there going to be anymore puzzles today? Wow, took me 2 emails to get it right (oops). Thanks so much Crowesfeat30, Yay! And good luck to everyone else who plays. Man, I gotta get those 20 posts so I can participate. Haha, less reading, more typing. It's not like im not on here until 1am usually. Can I get someone (or 2) to vouch for me? All who sent answers answered correctly. Now on to the next Question/Puzzle! Imagine a digital clock like the one most people have in their houses. How many times will the clock display three or more of the same number in a row over the course of one day? The clock in this puzzle displays time on a 12-hour scale, not military time. Oh man I wish I could reply I need to post more here. Aaaand we have our second winner with the correct answer of 34! I suppose you want my address now? Congratulations! I realized my answer was wrong a minute after I sent it in. How many contests will you be doing tonight? I plan on being awake, but if you are doing more, i want to pay special attention to when you post new stuff. How is this so? I only counted 12 over 24 hours - or were seconds counted? 17 per 12 hours, so 34 per day! Yea, 34 isn't adding up to me either. Did you mean 12, and just have a typo? 1. each row; 2. each column; 3. both diagonals; 4. the four center squares; 6. each quarter of the diagram. A number will be used only once per diagram. For those who cannot scan & send a copy of their answer as a picture, type the numbers in the correct columns in your e-mail to me. I have to get up early and work late so I will post the winner tomorrow evening. # 3 is still up and running and there will be more tomorrow, and the next night and the next.... Well you get the idea. When I run out of Feathers, one way or another, the cointest will end. Ooh! Caught me before Dexter ended! We have the last winner of the day!!! More fun & games tomorrow. You must be quick, because I beast @ some puzzles! Congrats, and can't wait to see what puzzles we get tomorrow night! What time will you be on Crow? Congratulations! At first I didn't realize that the sums were given but then it was too late. Way to Go OwlCacher! Sheesh, these sudoku-type puzzles always trip me up. Good work. Congrats to the winners so far! Hope I have a chance to win one. I hope this aint being played only while I am work, it would be a shame for me. I get off work at 5:00 pm so say 6:00pm or so. Central time. I got all evening tomorrow night so I'll be able to post more that three. Also, so y'all know, I will be out of town Saturday & much of Sunday so you won't get any puzzles on those days. Maaaaaybe late on Sunday evening. And I will try to post some during the daytime but I work most days - 9-5 type shifts - so so that could be a bit problematic. Wednesdays are usually good for that, tho. Congratulations to all winners so far!!! And of course thanks for all the cointests so far! Ok, so i have a question for you. Can I get a feather if I give you a question that you can use for the cointest? Either way, I will PM you with it. My uncle told me this one years ago, and it even makes my geography teachers think. Congrats to all the winners though........very well deserved indeed!! Congratulations to all the winners, that have won one of those beautiful feathers up ´till now. Oh boy! I missed a lot while I was sleeping!!! Oh! Your coins are beautiful!!!! WOW!!! Wow the feathers are nice I slept through this completly But looking at the puzzles it is just as well. DANG - that's me out from the very start! Oh well - I will have to live with that. You can always send me your feather and then you'll be able to play. Question/Puzzle # 4 How many coins? Say I collect Geocoins. One day, my boyfriend asks, "How many Geocoins do you have?" I say, "If I divide the coins into two groups, then 33 times the difference between the number of coins in each group equals the difference between the squares of the two numbers." How many coins do I have? Ding, ding ding! We have a winner!!! And if the number in the question were 34, I'd have 34 coins. Any number will work and the coins can be seperated into two groups of any size. This one had me STUMPED!!!! I'll try the next one! How 'bout something a bit easier? Question/Puzzle # 5 How Many Triangles? 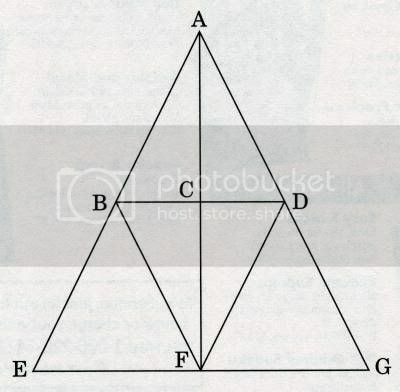 How many triangles are present in this diagram?